The coast of Samos has many beautiful beaches to enjoy as it is a large, lush island. There are at least 20 beaches which tourists and locals recommend. Mykali beach, south of Samos town, is covered in white pebbles and lapped by emerald waters and is one of the most popular beaches on the island. On the mountainous northwest coast of Samos, visitors will find the secluded Megalo Seitani beach which can only be reached on foot and richly rewards those who make the extra effort. There are a few other beaches on the island which are inaccessible to cars and these tend to be the most private and secluded. The Vlendza beach, just outside the town of Avlakia, has good amenities including sunbeds and umbrellas, as well as a small tavern. 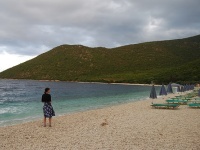 Tsamadou beach lies just outside of Kokkari Town and is the only official nudist beach on the island. The best beach on Samos for children is Psili Ammos beach as kids love to play in its warm, shallow waters and build sand castles on the shore. It is a very safe beach with calm waters. This long sandy strip also attracts migrant flamingos each year in December and the pink flocks are a delightful sight. There are also a couple of taverns nearby to enjoy. Psili Ammos beach is 35 miles (56km) southwest of Vathy.